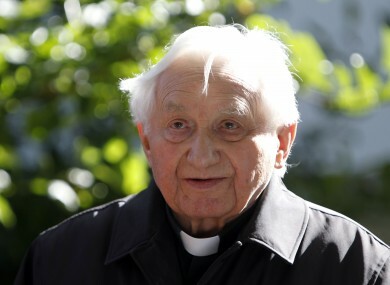 THE POPE’S brother Georg Ratzinger says the pontiff had been advised by his doctor not to take any more transatlantic trips and had been considering stepping down for months. Pope Benedict XVI announced today that he would resign effective February 28, with details of a conclave to elect his successor not yet announced. In recent times Benedict, born Joseph Ratzinger, had been using an indoor vehicle to travel the lengths of the massive St Peter’s Basilica in the Vatican. Georg Ratzinger did not answer calls seeking further comment. Email “Pope’s brother: Pontiff was 'considering resignation for months'”. Feedback on “Pope’s brother: Pontiff was 'considering resignation for months'”.